Leading Supplier of Industrial Brushes Producing the finest quality brushes at a fair price since 1920. Solo Horton has set the standard for industrial brushes since 1920. We constantly test new samples and try the newest designs – the old-fashioned way, with human hands. We combine this research with the best materials and workmanship. The result: industrial brushes that blend quality and economy at every price level. With millions of industrial brushes in stock and ready for immediate shipping, Solo Horton has the tools to handle your industry's most demanding applications. 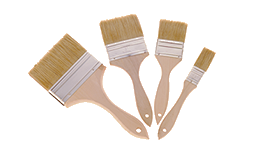 We specialize in supplying bulk industrial brushes including paint brushes, chip brushes, paint rollers, tube brushes, artist brushes, touch up brushes, cleaning and utility brushes to name a few. We stock a complete range of sizes and materials - from natural bristle to synthetic bristle, carbon steel wire, stainless steel wire, brass wire, and much more. Solo Horton is confident that we can supply the brushes you need at the lowest prices.